This MudWorks Pottery Chalkboard Branding is not only outreach by the craftsman, but personalizes the merchandise and says “crafted” not “Manufactured.” It also reinforces the benefit of “everyday use” so there should be no fear of investing in some wimpy, easily chipped, china. Again the hand-done do-it-yourself look fits in with the Rural Store merchandising motif. Best of all, it is inexpensive and reusable outreach. 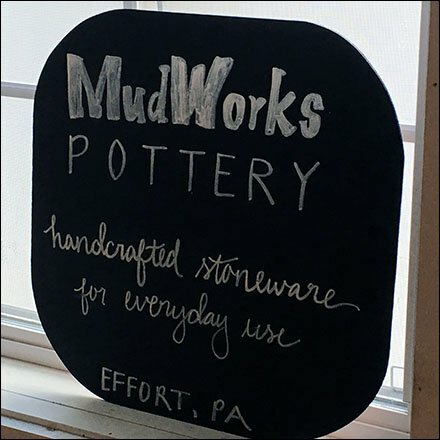 This MudWorks Pottery Chalkboard Branding seen at the Dairy Store of The Lands at Hillside Farms, a non-profit, educational farmstead teaching sustainable life choices, Shavertown PA.